Nobody likes shoveling snow or salting sidewalks, but it has to be done. 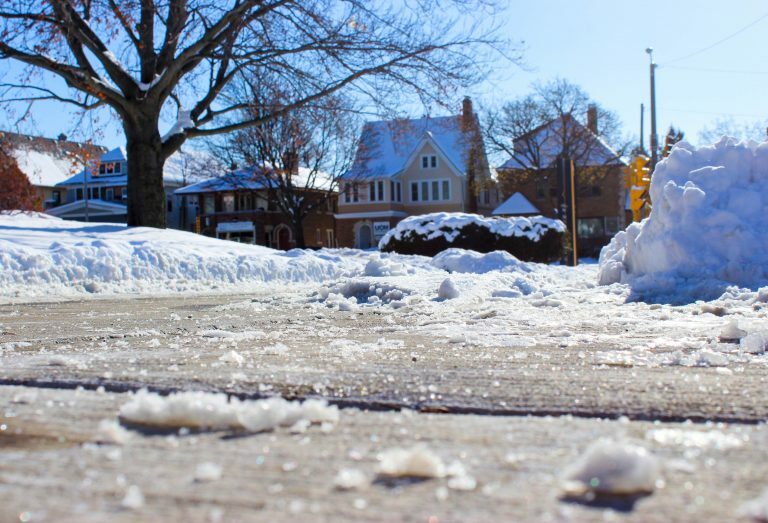 In Milwaukee’s climate, winter is inevitable, and it is important for property owners and renters to know their responsibilities regarding sidewalk snow and ice clearance. The City may take care of the streets, but homeowners, landlords, and sometimes renters are responsible for the sidewalks; homeowners/landlords have the duty of shoveling (and salting!) the portion of sidewalk in front of their properties–this includes bus stops. Landlords may pass the responsibility on to their tenants, however. Tenants in large apartment buildings can most likely rely on their property manager or rental company to clear their sidewalks, but tenants in smaller buildings or renting a house, like so many on the East Side and in Riverwest, may have this responsibility land on them. If you don’t know, check your lease agreement. (And even if you think you do know, it’s never a bad idea to double check). Whether it’s the landlord or tenant, Milwaukee requires that the sidewalks and bus stops be cleared. Sidewalks must be cleared within 24 hours of the end of snowfall. Those who do not fulfill this requirement can be reported to DPW and issued a $50 fine. If sidewalks are still not cleared within 24 hours of the fine being issued, an additional $75 fine will be added for the first violation, and a $100 fine for any violation after that. In addition to these fines, the cost to the City of snow removal will be billed to the violating party. These fines may initially be sent to your landlord, but if your lease outlines that tenants are responsible for snow removal, landlords can pass the fines on to you. If you find yourself standing in the cold with a shovel in hand, keep in mind that city ordinance prohibits the shoveling of snow onto the street. Shoveled snow should be moved either into a properties yard, or onto the strip between the curb and the sidewalk. Older citizens and disabled persons living in single family homes may be eligible for assistance from the Department of Sanitation in clearing the sidewalks when snowfall is greater than four inches. Not only is clearing sidewalks after a snowfall or winter freeze a safety concern, but if one is negligent, it can become a monetary headache. Snow may be beautiful on the ground, but it is a nuisance on the sidewalk. You can’t prevent a visit from Old Man Winter, but with the right knowledge and swift action, you can keep him from wreaking havoc on your pocket book.